If negotiations on an orderly withdrawal from the European Union break down completely, the UK risks a “chaotic Brexit” on 29 March 2019, with no overall withdrawal agreement in place nor any smaller deals to mitigate the shock of a no deal outcome. Both the UK and EU27 could take unilateral action to protect the rights of citizens in that scenario, but it would only amount to a “sticking plaster” solution, write experts at the UK in a Changing Europe initiative. 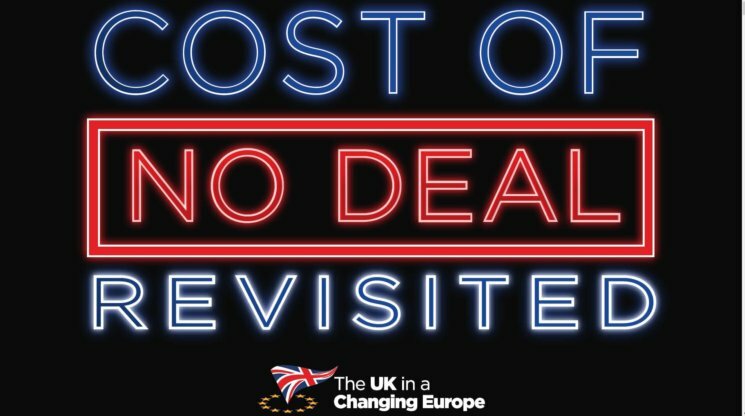 This is an extract from a longer report, Cost of No Deal Revisited, published on 3 September 2018. In the event of a chaotic Brexit, would EU and other EEA citizens living in the UK immediately become illegal immigrants? Would EEA citizens coming to the UK for work, study or tourism require visas – something which would immediately lead to chaos at ports of entry to the UK, and which would be disastrous for UK tourism? This seems unlikely. The government has promised it has no plans to simply “turf out” EU citizens, regardless of the outcome of negotiations. The main provisions of European Union law on freedom of movement of people have been fully incorporated into UK law by the European Union (Withdrawal) Act 2018 (EUWA) and recent amendments to the Immigration Rules giving effect to the planned future status of EU27 citizens in the UK. So, the right of EEA citizens (including those from non-EU countries, like Norway, and from Switzerland) to live and work here – and the legality of employers continuing to employ them, hospitals and schools continuing to treat and educate them, and so on – would broadly continue unless and until the UK government or Parliament changes the rules. Similarly, there is no reason why border arrangements and visa requirements would change immediately. But the status of a million or so UK nationals elsewhere in the EEA would be considerably more complex and potentially much more problematic. It is up to individual member states how they implement EU legislation, which partly regulates the legal status of non-EU citizens, in domestic law. Even with this common legal framework, there is much variation in how EEA countries treat UK nationals now, and this divergence would be likely to widen considerably after Brexit. Little progress has been made by EU member states in establishing the legislative and administrative mechanisms to implement the provisions set out in the draft Withdrawal Agreement in domestic law – let alone to make contingency plans for what happens if it is not approved. This is a matter of increasing concern for both UK nationals resident elsewhere in the EEA (except perhaps in Ireland, where they already have full rights in domestic law) and the UK government. There must be a serious risk that if the Withdrawal Agreement is not, in fact, agreed there will be nothing at all in place in at least some countries. If, like the UK, those countries have laws relating to immigration and residence that give special status to EEA nationals, then on Brexit Day those laws, in theory, will automatically cease to apply to UK nationals, because the UK would no longer be part of the EU or EEA. The same mechanism that protects, at least temporarily, EEA nationals living in the UK would also leave UK nationals in the EEA without such protection. EU member states (with the exceptions of Denmark and Ireland) have implemented key directives on the rights of third country nationals (TCNs), including the long-term residents directive which gives rights to reside to TCNs after five years’ lawful residence in the host country. This is presumably the status that would, in theory, apply to UK citizens: in general, it confers far fewer rights, and no rights for those without five years’ residence. This would be disastrous for many of those concerned. They could lose the right to reside, to work or to access essential services. They will also need to apply for EU long-term residence status. There are some EU laws on those resident for less than five years, as well as parallel national laws on long-term residence. There would be major question marks over the recognition of professional qualifications. In addition, UK nationals travelling to the EU would presumably be subject to the same requirements as third countries – and without an agreement on visa-free access and unless the EU decides to waive visa requirements unilaterally (as it does for a number of countries), this would mean, for most countries, applying for a Schengen visa. Apart from being expensive, it is unlikely the systems of many countries could cope with such a large increase in volumes. There would be immediate large-scale disruption to travel and tourism. If all this occurred, this in turn would raise the prospect of retaliatory action by the UK, which the government has explicitly threatened. While, as noted above, nothing would automatically change on Brexit Day here, the government would be able to use its new powers under the EUWA, to “modify, limit or remove the rights which domestic law presently grants to EU nationals, in circumstances where there has been no agreement and EU member states are providing no such rights to UK nationals”. In other words, EU nationals in the UK really would become bargaining chips. So the disaster scenario is one where, deliberately or simply through lack of preparation, UK nationals in the EEA are thrown into limbo, while travel becomes much harder; and the UK retaliates, placing a question mark over the status of some or all of the 3.4 million EEA nationals currently resident. Fortunately, this disaster scenario is unlikely to materialise. Even in the event of a breakdown in negotiations, or the rejection of the Withdrawal Agreement by the UK Parliament, it is very difficult to see how it would be in the interests of either side. The citizens’ rights text in the Withdrawal Agreement – the least contentious part – has been finalised. That does not mean, as some have suggested, that both sides could or would necessarily agree to implement the relevant part of the Withdrawal Agreement. For example, that includes rules on the precise remit of the European Court of Justice which, in the event of a complete breakdown of trust, might not be acceptable to either or both sides. More likely is that there might be coordinated but essentially unilateral actions on all sides to ensure that the status quo was preserved as far as possible. That is, both the UK and the EU27 would announce publicly that they would continue to respect the existing rights of each other’s citizens, and where necessary the EU27 and member states would take emergency legislative action to ensure this. This would avert immediate consequences of the sort described above. But it would be a sticking plaster rather than a permanent solution. Over time, uncertainties and legal ambiguities would mount, leading to significant numbers of people with uncertain and unclear status either with respect to residence or other important rights. Businesses in the UK would certainly find it much harder to recruit EU nationals. Eventually, it seems likely both the UK and individual EU27 countries would be obliged to clarify the legal position in some form, either through a deal between the EU as a whole and the UK to resolve this specific issue or as series of bilateral deals. Inevitably, there would be litigation – under domestic law, EU law and the European Convention on Human Rights – as individuals sought to clarify their status. But meanwhile considerable numbers of citizens would be likely to ‘vote with their feet’ and return to their countries of origin. The UK in a Changing Europe promotes rigorous, high-quality and independent research into the complex and ever changing relationship between the UK and the EU. It is funded by the Economic and Social Research Council and based at King’s College London.